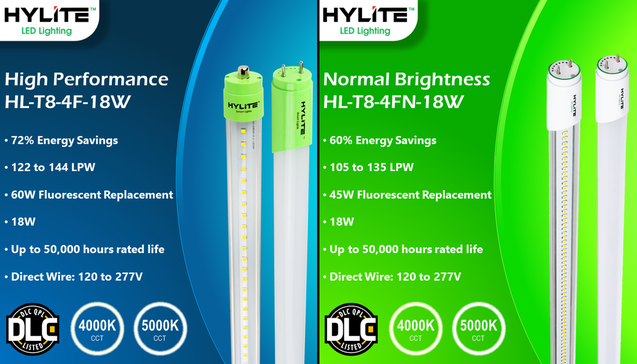 HyLite LED Lighting is excited to introduce a new LED Tube Light as a complementary product to its existing high-performance LED Tube lights. This new, normal-brightness LED Tube will provide customers a more economical choice in LED retrofit lamps while providing high quality, long lasting illumination. The new HyLite LED Tube light is a direct-wire LED retrofit solution that provides up to 50,000 hours of rated life. The lamp does not require a ballast or additional equipment to operate, which minimizes energy savings and eliminates a potential point of failure in the system. The 4 foot LED Tube runs at 18W and provides up to 135 lumens per watt. Listed on the Design Lights Consortium’s QPL, the new HyLite LED Tube qualifies for rebates from many utilities. With the addition of this new LED tube, HyLite LED Lighting is positioned to provide the right solution to fit any customer’s required illumination levels. For more information about the HyLite LED tube light, please click here. HyLite LED Lighting prides itself on designing innovative and cost-effective lighting products for commercial and industrial applications. HyLite is dedicated to the preservation of our planet by offering eco-friendly, energy-saving LED lamps, retrofits, and fixtures. For more information, please visit www.HyLiteLEDLighting.com, email us at info@arva.us, or call us at 803-336-2230.